If you do not see the date and time you are looking for, please check the other location’s schedule for more availability. 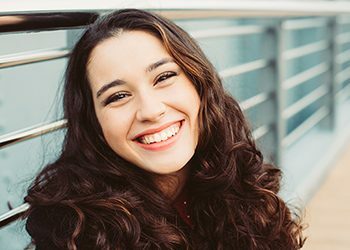 Be your best self at The Curly Hair Salon! New Location Opening in Branford in March! Where the Curly Girls Go! We're the curly girls too! Every stylist at our salon has experience cutting curly and wavy hair. You're going to look gorgeous! All of our stylists are specially trained in cutting curly and wavy hair – we do it every day! We are passionate about helping you look and feel your best! 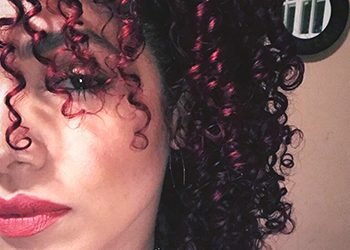 Any curly girl will know that it takes more than just an out-of-the-box color to get the look you want. Let us consult with you to pump up your curls with color! Get rid of that pesky unwanted hair! Our stylists are friendly and professional, and will put you at ease while we’re taking care of you. Only the best for our clients! With her entire professional career cutting wavy and curly hair, Luvena knows what you need! She can’t wait to meet you and help you create the perfect look for your curly, bouncy hair! First I would like to say God is so good!! A special thank you to Luvena for being so wonderful and helping a friend in need. Luvena you went above and beyond anything I could have ever imagined!! You are such a beautiful person, inside and out!! I’m forever grateful! I pray you continue to be blessed with health and prosperity!! Love Luvena! I have been going to her since 2008. Every time I walk out happy and love my curls! Today the girls at the sandwich shop I went to after my appointment were raving about my curls. One of them said she had never seen natural curls so beautiful. The other said curls like that were one in a million. My daughters love her too, and today she gave my 14 year old a fabulous back to school cut. Anyone I have ever recommended her to loves her! If you have curly hair you have to check out Luvena! I have been to many curly hair/ natural hair specialist and more hair salons and stylists than I can even count. No one has ever seemed to understand my hair. I have some horror stories about botched hair cuts and color. Luvena did my hair perfect on the first appointment. She not only gave me the hands down best curly hair cut I have ever had but also did my color (kind of blonde ombré) exactly how I wanted it without damaging my hair beyond repair! Not to mention she is just a sweet person! I will not let anyone else touch my hair from now on! She is the best! Best haircut I’ve had since moving out of NYC. If you have curly hair, this is where you need to go. p.s. I HIGHLY recommend her, she’s sweet and tremendously talented! I had my very long crazy hair cut on Wednesday and turned into a new woman! Thank you so much for helping me see what my hair is and how pretty my curls really are! I’ll definitely be back. Absolutely love my experience hair great service and hair! Staff is awesome all around ! My curls have never looked this awesome! Thank you!! Will be back for sure! If you’re a curly girl or transitioning your hair and you live in CT, might I reccomend Luvena Leslie Curly Hair Salon. Luvena I felt like I’ve known you for a long time. Thank you for a fabulous transformation and for providing a professional and welcoming salon. I certainly dont mind taking the 48min car drive up from Stamford! Thank you and Kadijah!!! What a great experience! I went into the salon a little nervous because I usually care for my own hair! But my hair needed professional help so I decided to try The Curly Salon out! First and Foremost Luvena and her assistant were super accommodating and nice! I asked for a trim an wash and go and Ms. Luvena delivered! I finally have shape to my hair and confidence to wear it down! First time at the salon 10/3 and had been researching on curly hair salon and I found this place and I must say I’m so happy I did!! I felt comfortable and love the atmosphere and loved how Luvena listen to what I wanted and also recommended on what I should get done and she did a Great job I will defiantly be back in a couple of months found my new hairstylist!!! My first visit to Luvena Leslie Salon was wonderful from beginning to end. I have naturally curly (3b/3c?) and dark hair, and wanted a dramatic color change. Luvena not only informed me that my desired color (honey blonde) was possible without bleach, and therefore without damaging my hair or altering my texture, but helped me understand every step. While I waited under the dryer, the staff gave me tea and snacks and gave me a copy of Curly Girl: A Handbook to keep me busy. After my visit, I began to use the Mixed Chicks line again (after a hiatus of a couple years) since I loved the results when Luvena washed, moisturized, and styled my hair. My friends and family were nervous before the color change, but I’ve gotten many compliments! I look forward to my next visit. Recently went to my first appt there and was very pleased with the results. I have 3b-4a type hair and went in for color which turned out very nice. I also appreciated the way my curl pattern really popped after they used Deva Curl. I received many complements about my hair which was terrific! 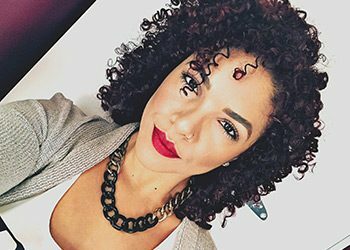 Not only does Luvena really understand curly hair, her salon has the old-fashioned feel of a neighborhood joint — everyone is friendly and chatty, and even if it’s your first time there, they make you feel like a regular. I even brought both of my girls, ages 7 and 10, for haircuts, too. I have longish hair with curly spirals, and I used to come home from salons looking like a poodle. Finally, I can get my hair cut and go out afterwards looking great. What a find! Best haircuts of my life, and a delightful person to boot. All stylists have a thorough understanding of how to cut, style, and care for curly hair. I received both a great haircut, and an education on how to manage my hair on my own. Very reasonable prices as well! At my first visit to Luvena Leslie I was 100% satisfied with my experience. I have thick, curly hair and it was very short at the time which can be quite a challenge to style but the stylist did an awesome job listening to my needs and executing a great cut. She was also very nice to talk with. And the atmosphere of the salon was pleasant, clean and bright, relaxed, peaceful. I loved everything about this women! She is personable, funny, warm and just flat out a miracle worker… My first experience was one to remember and it is a breath of fresh air to find someone who understands your type of hair. Cant wait till my next appointment. Luvena Leslie does a phenomenal job at cutting and styling curly hair! My hair is thick and unruly and she has given it the perfect shape. She has also introduced me to DevaCurl products. I would highly recommend this salon to anyone with curls! Luvena helps me love my curls! She is so warm and friendly. Makes you feel at ease. Gives you suggestions without pressure. Always get lots of compliments after a visit to her salon! Just received a haircut from Luvena today, and it was such a positive experience! I have had a lifetime of lackluster haircuts, including those from other salons in New Haven, and this experience was anything but lackluster. She taught me about how to handle my hair and cut the lace wigs so well, cut it like a pro, and was just an all-around delightful person. She carefully considers what you want, and delivers fantastic cuts for curly-haired folks like myself. I am absolutely sold — obviously, as this is my first yelp review, but I just felt passionately enough to warrant 5 stars! Thanks, Luvena! Luvena washed my hair and cut it expertly. She’s super friendly and more fun to chat with than a shrink. She listened to what I asked for and took just a couple of inches off with some long layers and face framing pieces. She blew out my hair and made it look gorgeous. I have naturally curly hair systems but I generally style it straight. I know they are known for the curly cuts but I loved the straight look she gave me. I have no hesitations about coming back or recommending this place to anyone! Feel beautiful inside and out at The Curly Hair Salon!